We study the physical, chemical, and biological processes that affect water quality in streams and rivers. This is important because clean water is an ecosystem service upon which life depends. Water in the Intermountain West is an increasingly threatened resource. Our work aims to understand and protect healthy freshwater ecosystems. 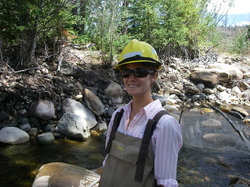 Julie Kelso is a Ph.D. student at Utah State University studying aquatic ecology and biogeochemistry. Her current research focuses on using isotopic tracers to identify sources of dissolved and particulate organic matter in urban rivers. She also has helped develop efficient and portable instream filtering methods to be used by personnel from any discipline. For her master’s thesis she investigated the potential effects of natural gas drilling on macroinvertebrate communities of headwater streams and the role of the hyporheic zone as refuge for macroinvertebrates from stream drying. Beth Ogata is excited to be a part of the iUTAH research project which seeks to address water sustainability issues on the Wasatch Front. She is currently pursuing a PhD in aquatic biogeochemistry and enjoying the biking opportunities in Logan, UT. Rachel Buck is a Ph.D. student whose research focuses on developing numeric nutrient criteria to protect wetlands around the Great Salt Lake. Suzan Tahir is a full-time environmental scientist at the Utah Division of Water Quality. 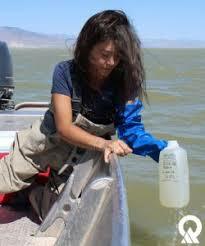 Her dissertation focuses on water quality status and threats to the Willard Spur of the Great Salt Lake.